Katharine Ashe presents the second book in the Twist series. Contains mature themes. The one that got away . . .
Six years ago, Tacitus Everard, the Marquess of Dare, made the worst mistake of his life: courting vibrant, sparklingly beautiful Lady Calista Chance—until she broke his heart. Is the only one she wants. 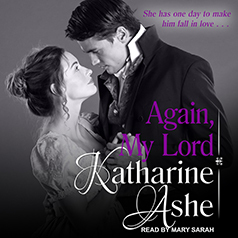 Six years ago, Calista Holland made the biggest misstep of her life: begging handsome, wealthy Lord Dare to help her run away from home—then marrying someone else. Now, trapped by disaster in a country inn, Calista has one day to convince the marquess she's worth a second chance, and Dare has one goal, to steer clear of déjà vu. But when the day takes an unimaginable twist, what will it take to end up in each other's arms?